Background: Appropriate design and development (in terms of mechano-chemical properties) of scaffold is essentially important for scaffold-based tissue engineering. Methods: In this study, scaffolds were fabricated using a desktop robot based rapid prototyping (DRBRP) system that was developed in-house. Poly lactic acid (PLA) and calcium carbonate (CaCO3) composites, doped with silver nanoparticles (nAg), were used for the scaffolds. The effect of injection parameters on the porosity rate of both, the single and hybrid scaffolds, were examined. Results: Clearly, the incorporation of 1 wt% of CaCO3, and 0.5 wt% nAg, had no effect on the flow ability of the viscous polymer, and thus optimization was easy. Scanning electron microscopy (SEM) analysis aided in optimizing the process parameters, and therefore improving the surface morphology, and pore structure. Compression tests were performed to understand the coupled effect of CaCO3 nanoparticles, and the porosity on the mechanical properties of the bulk scaffolds. The compressive modulus of the PLA/CaCO3/nAg scaffolds reached values of 0.38 GPa, and 0.28 GPa, at porosities of 40 % and 50%, respectively. Conclusion: Despite the difficulty in reproducing scaffolds with exact porosities, it could be concluded that the stiffness of the hybrid scaffolds increased in comparison to the single PLA scaffolds, at equal porosities. 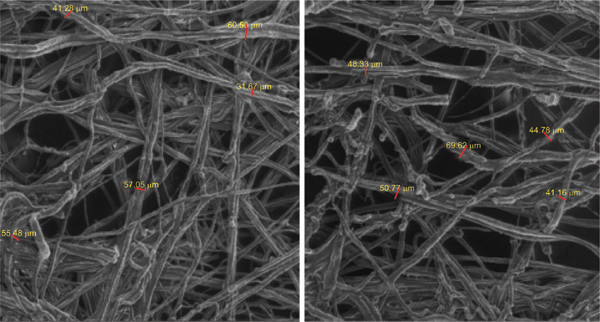 Electrospinning, chitosan, membrane, nanofibrous, filtration, antibacterial.